If you're in the market for a new, unlocked high-end Android phone (in the US) and you're looking for a good deal, Best Buy has something that may interest you. The retailer is currently offering free $200 gift cards with the purchase of an unlocked Samsung Galaxy S8 or Samsung Galaxy S8+. As you can see by visiting the source link below, Best Buy is selling the unlocked Galaxy S8 for $724.99, and the unlocked S8+ for $824.99, both only in midnight black (folks needing other color variants have to look elsewhere). With the free $200 gift card, you'll (kind of) end up paying $524.99 and $624.99, respectively, for the handsets. 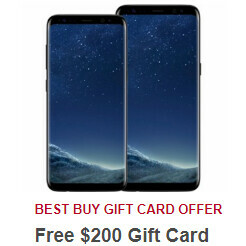 We say kind of because, since we're talking about a gift card, you're not getting $200 in cash, but you will be able to purchase anything within this amount from Best Buy. As a reminder, the unlocked Samsung Galaxy S8 and S8+ are compatible with most relevant US carriers, including the major ones - Verizon, AT&T, T-Mobile, and Sprint. If you haven't done it already, you can find out more about the two smartphones by checking out our Galaxy S8 review and Galaxy S8+ review. Avoid this very laggy phone. It can't even play San Andreas at an acceptable frame rate. He's so salty, bruh. :))) He needs to grab a report form and apply ample amounts of Preparation H to ease the bumburn. No, but the tears help to blur the reviews enough that he can't read them. It's not much, but it's all he's got. Please point on the doll where the Samsung rep touched you. Maybe you're finally learning. Nah. If you're gonna bash Samsung, do it over the sealed battery and fragile construction. Both are LEGITIMATE fails. I own the S8. No lag here. Or, they could read all these reviews, which crown it the best smartphone available. http://www.t3.com/features/best-smartphonehttps://www.cnet.com/topics/phones/best-phones/http://www.techradar.com/news/phone-and-communications/mobile-phones/20-best-mobile-phones-in-the-world-today-1092343/10http://www.tomsguide.com/us/best-smartphones,review-2223.htmlhttp://www.pcadvisor.co.uk/test-centre/mobile-phone/best-phones-for-2017-3210667/http://www.pocket-lint.com/news/120309-best-smartphones-2017-the-best-phones-available-to-buy-todayhttps://www.stuff.tv/features/smartphone-supertest-2017-whats-best-phone-right-now/smartphone-supertest-and-winnerhttp://www.toptenreviews.com/mobile/phones/best-smartphones/http://www.expertreviews.co.uk/mobile-phones/1402915/best-smartphone-2017-the-top-ten-uk-phones-from-samsung-apple-google-and-morehttp://www.consumerreports.org/smartphones/samsung-galaxy-s8-phones-top-consumer-reports-smartphone-ratings/ But, you're right. They should probably listen to some nameless tard with a severe case of rump rash on a tech website comment section. You don't even own the phone so go play little boy. What idiot would even consider trying to play GTA on a phone anyways? Samsung will never change. In 2016 and S8 is horribly laggy!!!!! Its actually 2017,and it's the best reviewed phone in the world, number 1 according to almost every reviewer. Same as 2016 and 2017. Sorry that hurts you so badly. I'd post all the links again, but you wouldn't be able to read them through the tears.